‘Adam Hall’ the creator of Quiller was the pen-name of Elleston Trevor. 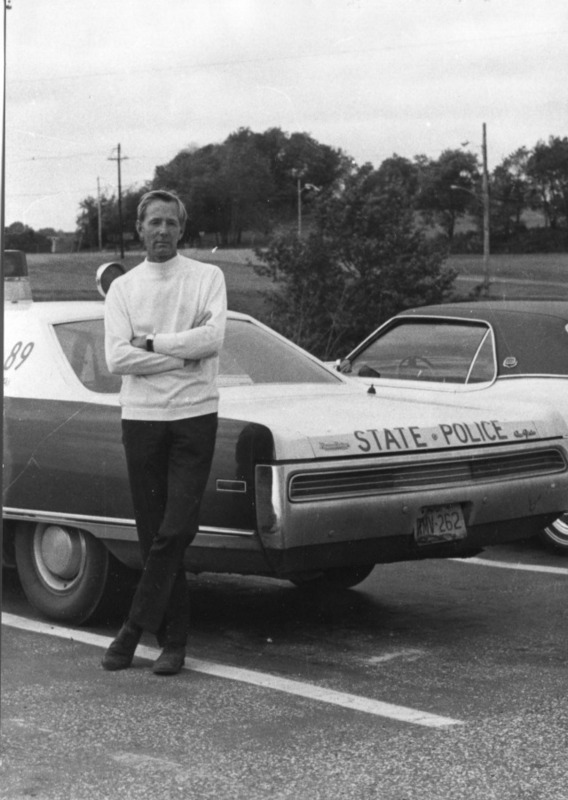 Here, his son Jean-Pierre continues his memories of living with the legendary fictional agent. Part I of his memoir was published in the Top Notch Thriller edition of The Ninth Directive in 2010. "Man is a warring animal, and if he is going on warring (and I’m damn sure he is), we’ve got to have spies. I think the future of the spy novel unhappily is going to be the same as the past: we are going to go on having to spy." As far as I know, my father never went to Russia and he almost never wrote about places he had been. I will never know if he had been an actual spy but perhaps that is a clue; he certainly knew a great deal about the tradecraft of spying and there is a lot of my father in Quiller. When I re-read the sections where Quiller is in a close combat situation, fighting to survive, I see my father’s deep rage and I know that he would have been just as lethal and dangerous as the character he created had he lost control. 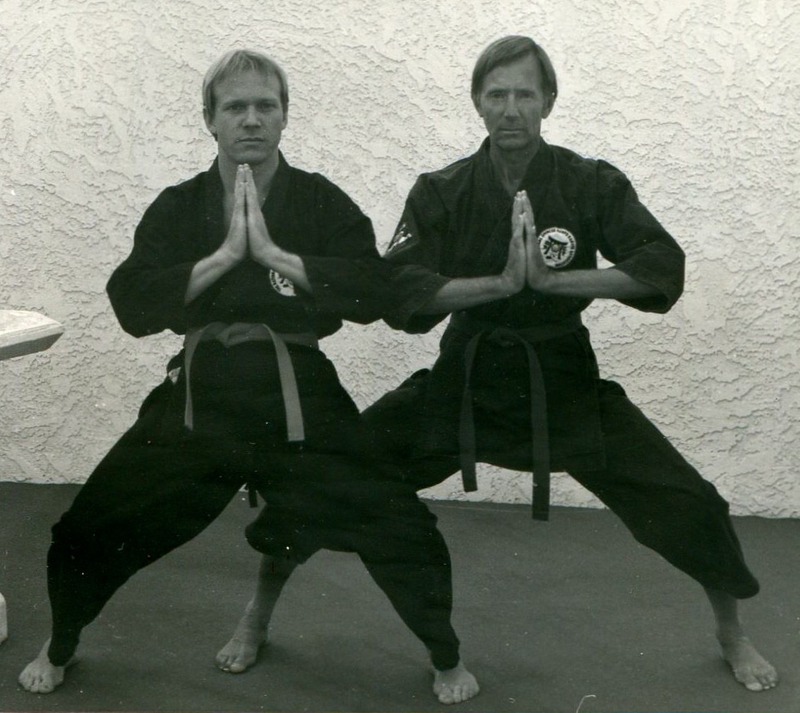 We both have Shodan black belts in traditional Japanese Shotokan karate. I’ve read in a few articles that my father didn’t consider me an equal match but since we never fought like that, nobody will ever know the truth of it. My father’s last book, Quiller Balalaika, was finished a few days before he died. I had helped him complete it (see FINAL CHAPTER on www.quiller.net) and I later buried some of his ashes in a small Native American jar on a 6,000 foot peak in north-east Arizona. I sipped some Fernet Branca and said goodbye. 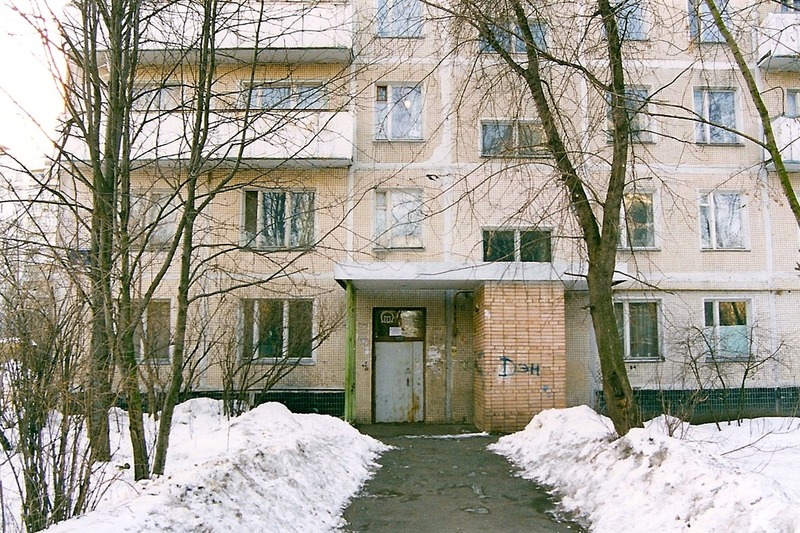 A few years later I was walking on Russian soil, in Quiller’s footsteps, and living on the outskirts of Moscow on the council estate from Hell – one of my safe-houses. For the whole time I was there, it never got warmer than minus 10 and often dropped to minus 23. BA Flight 005 to Moscow. I arrived at Sheremetyevo airport in Moscow at night and sat outside in a bus shelter in the snow. A few months prior I had been brought to Moscow to design a major rock concert next to the Kremlin – in the State Central Concert Hall inside the vast Rossya hotel – for Russia’s leading rock star, Laima. She had fallen out with Krasnov, Russia’s top designer (Red Square military marches etc). The concert I designed was a hit. The crème of Russia’s entertainment industry were there among the 3,000 guests and, I imagine, a lot of mafia; ideal for Quiller. For the concert I had arrived on a red carpet with the full force of Laima’s Russian bodyguards to look after me. Now, many weeks later, I was sitting in a bus shelter on my own. The bus was late but at least my contact was inside. We arrived an hour later at a housing estate on the Skhodnenskaya metro stop, where I was greeted with lots of food and drink. It was Christmas and bloody cold. There were also a man’s legs lying out of the three-foot square beaten up dirty lift. There was a body attached and I was told he had come in from the cold to survive. I could smell alcohol. I had asked the Foreign Office for survival tips for where I would be living in Moscow. They had told me (via faxes) to stay inside after 9pm and not to eat unwashed fruit from the outside stalls. Like Quiller I ignored their advice. The apples were delicious. I walked around in Siberian conditions (learning Russian) with frozen fish and beer in my backpack; no need to take them back to a fridge. I had spent weeks looking for the right jacket and boots for the winter conditions. My ‘Russian jacket’ as I now call it, has seven zip pockets. One is well-concealed in which I kept my passport. I was never stopped by the Police and never mugged. Actually I felt at home in Russia. Two months later for safety reasons I decided to stay in a hotel operated by the Ministry of Health – across the frozen river that runs through Moscow. The front door of the hotel was a huge battered piece of steel with burn marks and graffiti and it smelt of piss. Just inside was a dirty curtain and behind this a security guard – a soldier in battle fatigues; a military cot; two enormous guns and a huge grin to welcome me. This was very much Quiller turf. Very ‘red sector’. Some while later I went to the loo. When I got back to the lounge, the head of the local Militia told me some mafia had just been into the hotel while I had been in the loo. But he said they were only ‘amateurs’ and not to worry. They wanted protection money from the hotel. ‘I told them to go away…’ the Militia chief told me. I sat down and emptied another shot of vodka into the synthetic plant tub behind my seat. I drink little and I had been offered about ten shot glasses already. I had eaten from a huge jar of Beluga caviar the Militia’s mother had brought in which helped soak up the vodka. ‘You design for Laima so you are my friend,’ said the Militia man. He passed me a beer across the round table. I looked at him then at the bottle cap. He took out his gun and passed it to me, making a ‘pop the cap’ gesture. So I did, with the trigger guard. I handed him back his gun. I tried to look cool. If I was going to be recruited as a spy, this was one of those ideal moments. But it didn’t happen. Instead we went downstairs and played pool. I can’t play but I beat the Militia chief and he beamed me a big smile. The only spying I’ve ever done was when my parents arrived back at an airport, usually Phoenix Skyharbour International in Arizona (where we lived for a while - I was born in London; my mother - an Intelligence officer in the war - in Wales and my father in Bromley, Kent.) I’d watch my father from the shadows. I’d come up near him and say: ‘Q’. This was our sign that lasted many years. Our license plates were Q1 and Q2. Short of being sent out on a dangerous mission I’ve practically lived Quiller. His methods have helped me survive. ‘Adam Hall’ checking out local law enforcement in Arizona. While in Moscow I was approached by Russian soldiers. They wanted cigarettes. My ‘minder’, the son of a Russian diplomat, told me while we were eating dumplings in a Moscow cafe, that a lot of weapons had disappeared from the Russian military recently. I asked what kind. He said big things. I assume he meant nuclear. 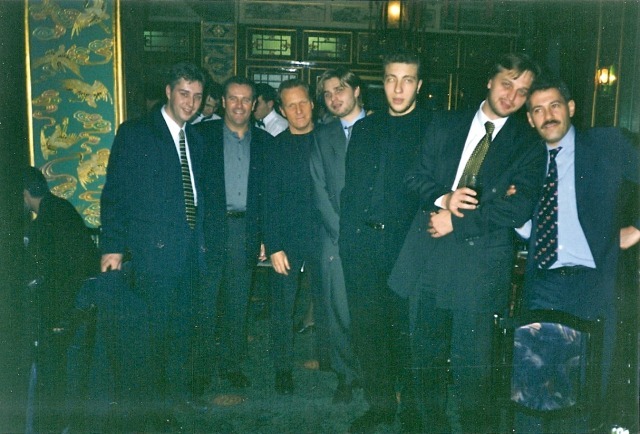 He also said that Russian mafia make Italian mafia ‘look like boys.’ During the time I was in Russia, there had been 376 contract killings. They will use rocket launchers if necessary I was told. I wonder how Quiller would plot his moves these days or which missions he would gladly accept now that we have terrorist cells in so many countries. My father often asked my thoughts on Quiller. 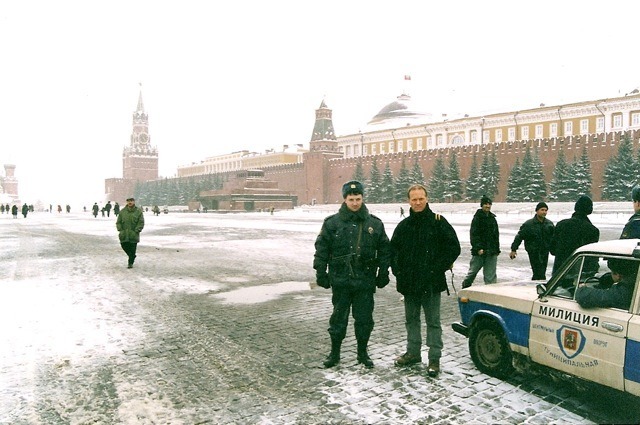 Had I been sent to Russia to do location hunting for Quiller, I am sure my father would have had him stay in the vast 2,300 room Rossya Hotel bang next to the Kremlin. (The hotel was demolished in 2006). There was a weapons shop right outside the main entrance to the hotel. They had every type of weapon, from small (by Russian standards) to huge. I was a guest of the Russian rock star Laima who had taken over the top floor of the hotel for the concert. My suite was the next floor down until I complained that prostitutes were banging on my door late at night. I was moved to the same floor as the star. An hour later (while I was waiting for the lift) an angry journalist wanted to kill the President of Russia and blew his car up not far from the hotel, near the gates of the Kremlin. Nobody was hurt. Seconds after the bomb went off and the building shook, the ‘security’ lady on my floor looked at me, smiled and told me it was ‘fireworks’. I ran outside. The smell of cordite was intoxicating. When I got back upstairs, the security lady was reading a book. Quiller would have felt very much at home in the Rossya hotel but would have hated the bang. J-P Trevor (third from left) in with the Russian ‘in’ crowd. If my dad asked me where to place Quiller today, I would send him to Rebirth Island in the Aral Sea in Kazakhstan that was a testing-ground for biological weapons; “arguably the most extreme human-induced disaster zone on earth” ( Extremes Along the Silk Road by Nick Middleton, 2006). I would imagine there are other places like Rebirth that are still active and money opens many doors, and the doors to these bio-labs are no exception. A spy who is a link between these places and terrorists, is what would concern me the most. Quiller with his instinct and experience, would I am sure, find a thread running from Rebirth Island to the centre of governments, possibly the CIA, and from there a mission is born. In medieval times they had wooden clubs and some arrows. Now we have technology and chemicals that are far more dangerous. Tiny amounts can do so much damage. Not wise to be complacent about spies. Especially if they are on a terrorist’s payroll. I don’t know what a spy looks like. Probably like a normal person. When my father lived in Mougins, France, he met an American writer who was writing a book on the life of George Eastman. My father thought: how dull, a book about Kodak. Then with his analytical mind he asked himself why this American writer travelled to Russia so often with his beautiful polio-victim wife. A few years later, he asked a journalist in Phoenix, Arizona about the American writer. My father came right out with it; ‘How long was he in the CIA?’ The journalist went quiet and said ‘Let’s talk about that some other time.’ So I might have met a real spy. I will never know. My father told me he believed microfilm was stashed inside the wheelchair on the Russian trips. London 2008: Someone to play Quiller? The waiter put a bowl of crisps on the table. ‘I need the salt,’ said Mr Bond. OK, ex-007. We had met in a London wine bar of his choice. I was impressed. He came with no minders. Nobody. Just himself. We had built up trust from the start. I had not tipped off the media. And Pierce Brosnan had not told the press about me. Which was a relief; nobody would have come. I had walked into the Groucho Club a few days before with a friend to have a sandwich. I saw the silhouette of a man. I knew who it was. I did a quick calculation: MGM has the movie rights to Quiller and they have been sitting on their arse for too long. What if I could get Mr Brosnan to play Q for an eighteen-book film franchise? I wrote a quick note, gave it to the restaurant staff (Mr Bond was eating) and left, believing I would only get a polite ‘thanks’ from his Los Angeles office. He came in with dark glasses, took them off for a moment, looked around the bar, and went outside. He had never seen me before. He came back in just as I had finished talking with my agent about what I could, and could not say. I had put my backpack behind the bar and had changed my shirt in the toilets. It was like he had just walked off a Bond set. A dark blue shirt and that confident 007 look. I told him he was good as Bond (which I mostly believe) and that 007 had gone sour; that Daniel Craig (a good actor) has portrayed Bond as a common brutal thug making the movies look like any other cheap action flick. Putting a bow-tie on someone does not make him Bond, I thought afterwards. Mr Brosnan called me a few weeks later. He passed on Quiller, saying he had plans of his own that might conflict. We agreed to keep the doors open anyway. I still have his cell phone number. We have had Bond and Bourne and loads of bangs and explosions but I see no real agent (cliché -free to start with) on the horizon. And the only film that comes even close to how I would portray Quiller is Roman Polanski’s The Ghost. 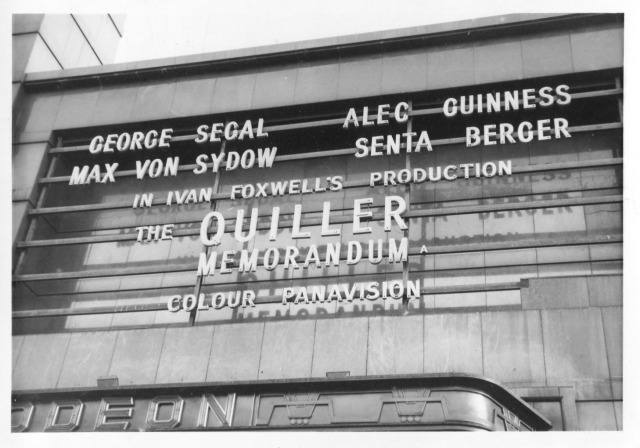 The premier of The Quiller Memorandum in London’s Leicester Square in 1967. After 9/11, MGM and a few others decided it was time for a new kind of agent, with less explosions and violence, understandably. And the rumour was that Quiller would be it. But then Sony got involved with MGM and plans went pear-shaped and 007 got a ‘remake’. Martin Campbell was about to talk to an L.A. production company about directing Quiller, then suddenly he went and did Bond…the movie industry can be as complex, and mysterious, as an agent’s life. For me ‘Q’ as I call him, is ideal as a new agent, especially so if 007 goes down la toilette. Public taste changes and I feel Q’s time is here now. Extreme violence in films is getting so unimaginative and with the recent Bond films looking a bit too much like Quiller and Bourne somewhere in between, a slight tweaking is needed, but with the raw essence of Quiller intact and all his neurosis well fed, I promise. If my father was still writing Quiller, I would guess his character would be essentially the same but leaner and more spiritual (to cope with his ‘barely controlled rage’), liked guns even less, still hated bangs and was nicer to dogs. And still far tougher (internally and externally) than Mr Bond will ever be. An agent for our times.